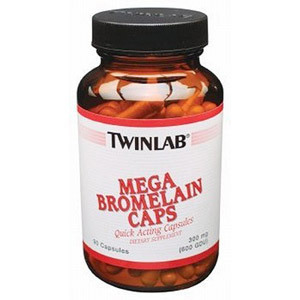 Mega Bromelain (600 gdu) Quick Acting Capsules Twinlab Mega Bromelain Caps are the highest quality and purest form of bromelain available in quick acting two piece capsules. Bromelain is a proteolytic enzyme obtained from the stem of the pineapple plant (ananas comosus). Mega Bromelain capsules are easier to swallow than hard tablets and dissolve faster to assure maximum benefit. This entry was posted on Saturday, April 28th, 2007 at 12:01 am and is filed under Vitamins And Supplements. You can follow any responses to this entry through the RSS 2.0 feed. You can leave a response, or trackback from your own site.